The inquisitors were perhaps a bit impatient to hear about the devil, the cat and the curious story of the Skulls. This story became connected to the Order and is mentioned in the inquisitions records and in the versions held by the freemasons, which adopted the skull and crossbones and often employed it as a device on tombstones. When Sir Logan’s skeleton was rediscovered at South Leith Church. During the restoration of the Church in 1847- 48. The Jaw bone was missing and a explanation of this can be found in the ceremony of installation in the Masonic cross degree of the Knight Templar of Jerusalem under the obligations of the Masonic Order. The obligation start In the name of the blessed trinity and in commemoration of St John of Jerusalem, the first faithful soldier of and martyr of Jesus Christ. I do solemnly promise and swear that I will never illegally reveal the secrets of a Knight Templar to a Royal Arch mason…if ever I wilfully violate this, my solemn compact as a brother Knight Templar, mat my skull be sown asunder with a rough saw, my brains be taken out and put on a charger to be consumed by the scorching sun and my skull in another charger in commemoration of St John of Jerusalem, that first faithful soldier and martyr of our Lord and Saviour…” The penal sign, which is to draw the forefinger or the thumb across the forehead, is indicative of the penalty of having the skull sawn asunder. David Lindsay had Masonic connections and was most likely a Mason himself. He also knew William Schew who set up the first Masonic lodges in Scotland. Not only this, David Lindsay might have been obeying the orders of the king: the monarch was and still is the head of the Masons in this country or, as today, a close relative of the Monarch and Royal Family. During the restoration of the church in 1848 many of the original gravestones within the Church were smashed. The bits used for the floors of the east porches of the church. I suspect this was done to cover up any connection with the freemasons, freemasons having an ambiguous position within the Christian church. Bearing in mind the disruption of 1843. They didn’t want any further problems. These gravestones can still be seen to this day. Errata- The picture illustrating the article “Templars in Leith” (July 2002) of a “Masonic Tombstone” although correct has caused some confusion to my readers. This Tombstone is not at South Leith Parish Church and I can only apologise to any visitors to South Leith Parish Church expecting to find it, and who have been disappointed. This particular Tombstone is to be found at St Margaret’s Church Restalrig and was used due to the fact that prior to 1560 St Margaret’s was the Parish Church of both Restalrig and Leith. However the Baron’s of Leith and Restalrig the de Lestaric’s and the Logan,s were in the Middle Ages both Templar knights and later the Logan family had very strong Masonic connections. This is the possible explanation of why Sir Robert Logan is erroneously connected to the foundation of the Preceptory of St Anthony. The “Rental Book of St Anthony” which names Sir Robert Logan as founder of the Preceptory of St Anthony was simply made up from unknown sources because in the early years of the 16th century plague broke out in Leith and out of about a dozen monks only two survived because they had fled. Subsequently the people of Leith broke into the Preceptory and destroyed all their records because among them would have been Tax and debt records. So when the monks returned they had no records to base their so called Rental book on. It is only in recent years and with access to the Papal records and by using the Ballantyne Records that a truer picture has emerged as to the origins of the Preceptory of St Anthony. However South Leith Churchyard has a number of fine Masonic Tombstones including that of Robert Gilfillan who was well known in Leith as a poet of more then average ability. He was Collector of Poor Rates and Bard to the Grand Lodge of Scotland and enjoyed the acquaintance and friendship of the Ettrick Shepherd. A book of his poems was set to music for example the exile’s song “O why left I my hame?”. He died in 1850 and was buried in South Leith Churchyard where an elegant monument, erected by friends, marks his grave. This stone stands at the east end of the Churchyard and can be easily found. It is an interesting Tombstone to visit as it shows various Masonic Symbols. 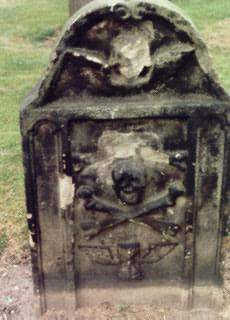 Another example of a Masonic Tombstone at South Leith dates from 1656 is the Tombstone of Alexander Abercromby which stands at the west end of the Church and shows the skull and crossbones motif. He was not only a Mason but a very brave man as well. In 1645 the plague struck Leith which had happened several times before in previous years. However the difference this time was that the plague was a mixture of Bubonic and Pneumonic Plague and if you caught that it was usually fatal within three to four days. It is recorded that within a few months 2736 people died of this horrible disease between, April 1645 and October 1645. I said Alexander Abercromby was a brave man because it was his job not to only gather whins and heather to burn inside the infected houses. He also carried out the fumigation of the infected houses as well. The death rate amongst men and women who did this needless to say was very high. However Alexander survived and his Tombstone was the first Tombstone to be erected in the Churchyard.. It is a sobering fact that from the sale of the goods of the dead victims of the plague who had no heirs a silver basin was purchased and this basin has been used since 1647 to the present day when children are baptised in the Church. If anything shows that good, faith and hope will triumphant over disaster then this basin does exactly that. If anyone is interested in Masonic Tombstones I would be only to pleased to do a guided tour and this can be arranged by contacting the Session Office at South Leith Parish Church at 0131 554 2578 or through the Church website. South Leith Parish Church Kirk Records.